Left: orange cup coral photographed by Wiebe Nijland. Right: the hard skeleton of an orange cup coral washed ashore. Photo by Maria Shallard. ​​This bright orange to yellow hard coral looks similar to an anemone: it is round, and ringed with orangish to clear tapered tentacles. 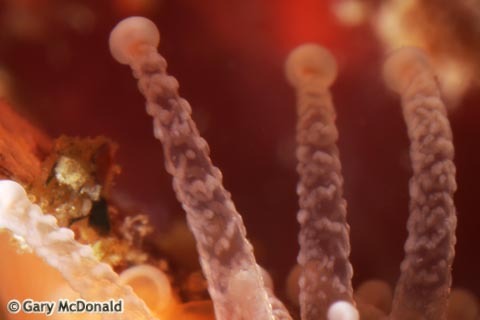 That tentacled, anemone-like animal is a single coral polyp, which sits on and is given structure by a hard skeleton. The skeleton is made of calcium carbonate (limestone) and is cemented to rock. 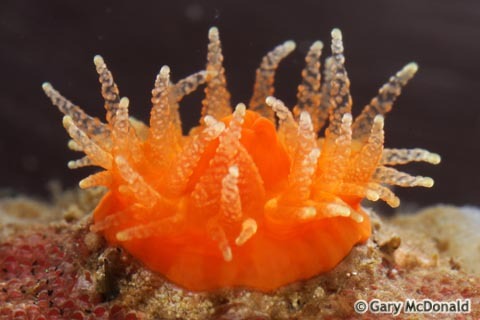 While this cup-shaped animal may appear in clusters or aggregations, it is considered a solitary species as it does not form colonies of many polyps on a single ever-growing limestone structure, as with reef-building corals found in the tropics. 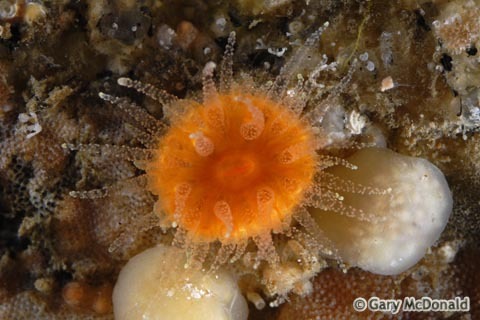 Individual orange cup corals reach 1-2.5 cm in diameter. 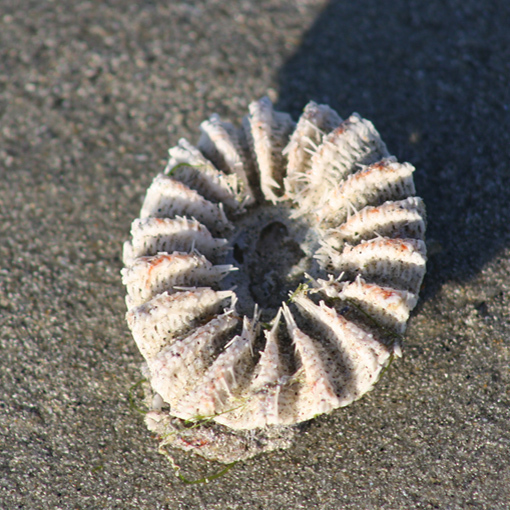 The orange cup coral is a common species in the lower intertidal and subtidal of rocky shores — particularly shorelines that are exposed or partially exposed to strong surf, including surge channels. It may be found in kelp forests, in sea caves and deep tidepools, and under ledges and boulders. Its range extends from southern Alaska to Baja California, Mexico. 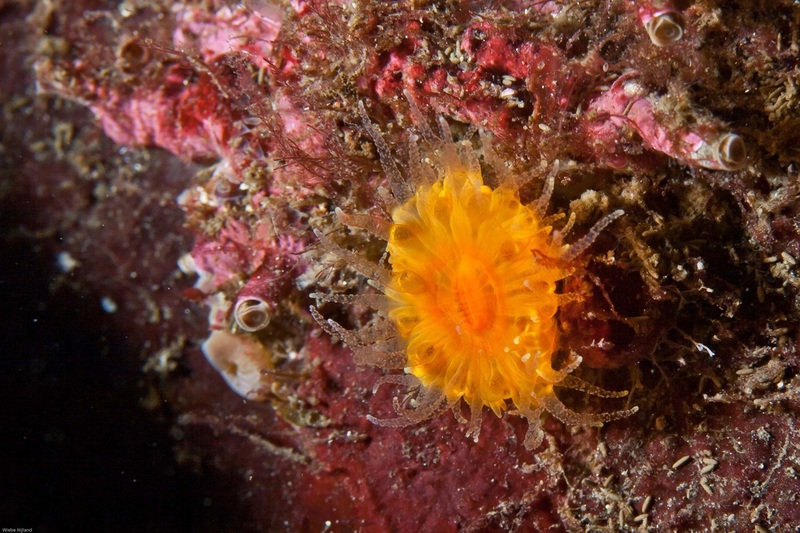 The strawberry anemone (Corynactis californica) can be orange and is similar in size to the orange cup coral, but does not have a hard skeleton; if the presence of a hard skeleton cannot be verified, check the tentacle tips: they are tapered to a point on the orange cup coral, and end with a small sphere on the strawberry anemone (club-tipped, or capitate tentacles). Other solitary hard corals found on the BC coast are the brown oval cup coral (Paracyathus stearnsi) and the round tan cup coral (Caryophyllia alaskensis). 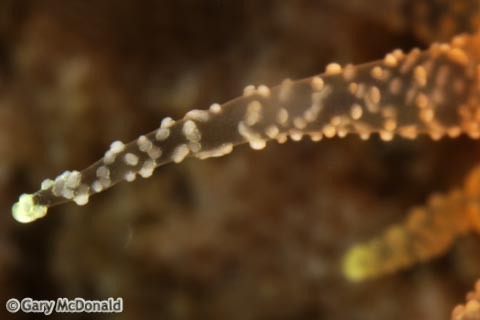 The tentacles are dotted with tiny wart-like nodules, which contain stinging cells (nematocysts) used for protection from predators and for catching prey. Balanophyllia elegans - Orange Cup Coral. Sanctuary Integrated Monitoring Network. National Oceanic and Atmospheric Administration. Accessed 04/02/2016. Carefoot, T. (2014). Balanophyllia elegans Verrill, 1864. E-Fauna BC: Electronic Atlas of the Fauna of British Columbia. Lab for Advanced Spatial Analysis, Department of Geography, University of British Columbia, Vancouver. Accessed 04/02/2016. Cowles, D. (2005). Balanophyllia elegans Verrill, 1864. Invertebrates of the Salish Sea. Rosario Beach Marine Laboratory. Accessed 04/02/2016. McDonald, G. Balanophyllia elegans Verrill, 1864. Intertidal Invertebrates of the Monterey Bay Area, California. Long Island Marine Laboratory, University of California, Santa Cruz CA. Accessed 04/02/2016.